Do you know about welovefrenchknots? New blog by BariJ about embroidery. You should be a guest on it! She's got some how-to videos, too. 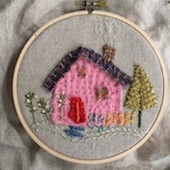 Helen in Australia does stitching Sundays where she teaches new stitches on Sundays. And Betz mentioned Bari's website. Love it! Just looked at one of the sites for how to do French knots. Thank you! the most beautiful sunshine and clear blue sky and record temps as well. The sun rise in the mornings has been stunning. Have a lovely weekend. You're gonna love the woven stitch - I taught it to my friend, Julie, and she really likes it. It sure looks great on that little house, doesn't it? You will really get the feel of them and it's like riding a bicycle - you can do it every time! GREAT sites for stitching - all of them! This is sooooo cute and original ! Love your style. Oh, and thanks for the links! Stitchers can never have too much instruction. The Readers Digest Complete Guide to Embroidery Stitches is a great resource. I found a copy at my local library and I must say I was plesantly surprised at it's usefulness. Thank you so much for the great links. So cute and original! Love your style. Nice work!